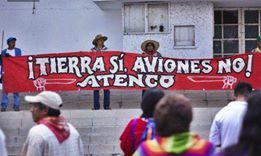 You are here: Home › post › Nahua people of the Valley of Mexico Say No to Airport Expansion! 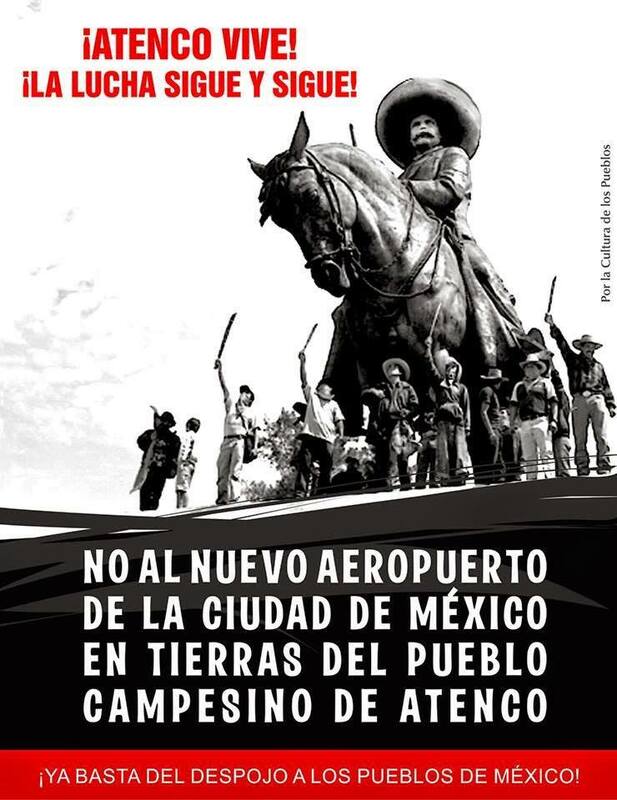 Nahua people of the Valley of Mexico Say No to Airport Expansion! We reaffirm our autonomy and self-determination, as well as independence from political parties and unsupported assembly “advisors”. We reject the proposals for “Public dialogue with the virtual elected candidate to the Presidency of the Mexican Republic, the Chamber of Deputies and the Mexico City Airport Group” and of “Popular Referendum” because it is a demobilization strategy seeking to confuse and confront peoples in order to impose the megaproject; for not being consented, because we do not accept that other groups speak on behalf of the peoples and the non-parties organizations; and because of noted contradictions by AMLO and his team, particularly Urzúa Macías and Jimenez Espriu, by establishing as the only options: 1. To continue construction of the New Airport in Texcoco Lake with public money. 2. A concession to private enterprise, or 3. Building it on the military Base No. 1 Santa Lucía located in Zumpango, State of Mexico. Equally incongruous is the step taken by the virtual elected Government aimed at a “smooth” agreement with entrepreneurs, disregarding those affected or to the people of Mexico, with a simple “smokescreen” phase as is to review the contracts, lacking this crude business plan a national and global vision, the effects bought on by the mega-project and the aviation expansion in the peoples and nature life, which also does not provide benefits to communities, villages, neighborhoods, colonies, farms and places in an area such as the Valley of Mexico, considered one of the most important sites of the Neo-volcanic axis, that holds 2% of the planet biodiversity that is essential for life and water depletion with an indefinite ban decree since August 19, 1954. We denounce that current 3 levels of Government have been trying to impose the construction of the New Mexico City International Airport (NAICM), the Aerotropolis and associated works as roads, highways, trains, gas pipelines, incinerators, high-voltage lines, exploitation of mines, water springs and rivers encasing, wind farms, real estate projects, shopping malls, tourist developments, industrial parks, gigantic landfills also called metropolitan sanitary landfills, the works of the eastern draining tunnel, etc., without taking us into account and without any respect to our constitutional rights and those referred to in international treaties (including the precautionary principle) that protect the peoples of Mexico and the world and that provide the legitimate right to manage their territory and natural resources. Businessmen, bankers and governments at their service, have deceived, manipulated, stripped, taken, looted, evicted violently, destroyed natural, historical and cultural heritage, and irresponsibly indebted our communities and the people of Mexico, through structural reforms, legislation modification, consultations rigged to update ecological ordinance programs, fraudulent assemblies; impersonation of figures and traditional authorities, the creation of supposedly citizens committees and the appointment of auxiliary authorities, in order to avoid having to deal with peoples; the division of communities and families by the intrusion of political parties; the use of public forces (army, navy and police officers), infiltration and illegal granting of land to members of the PRI-Antorcha Campesina paramilitary shock groups; and fraud committed by the National Water Commission (CONAGUA) in the year 2010, which under pretense of aquifers overexploitation throughout the basin, asked farmers to cede large tracts of land for a mitigation project and recharge of groundwater and environmental recovery of the Texcoco Lake (natural climate and rain water regulator and entire Valley of Mexico ecological balance axis), and subsequently – without consulting the peoples – assign them to the Mexico City Airport Group. Stop the ecocide and collective irreversible environmental damage to the Valley of Mexico of the and its people. Efficiently modernize the already existing airport system in the Central Region of the country (Megalopolis) which includes the Benito Juarez Mexico City current International Airport and those for tourism of Cancun-Quintana Roo and Acapulco-Guerrero, as well as the national aerial logistical planning. Operate at full capacity the Toluca International Airport, in the State of Mexico currently underutilized. And based on the proven technical, financial, environmental and social non-viability proceed with THE DEFINITIVE CONSTRUCTION CANCELLATION OF THE NEW MEXICO CITY INTERNATIONAL AIRPORT, projected with six runways on the Texcoco Lake bed, as well as other mega-projects already ongoing in the whole Valley of Mexico and the rest of the country. We call on national and international level to continue organizing to confront the capitalist system and to join this effort, which defends life, nature, and our legacy. 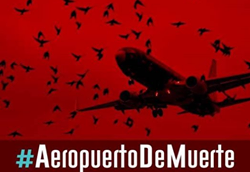 NO, to the largest and most corrupt death mega-project in Latin America: the unfeasible, unnecessary, ecocide and unaffordable New Mexico City International Airport! NO, to the Texcoco Lake death! ALSO SUBSCRIBED BY: Coordinadora de Pueblos y Organizaciones del Oriente del Estado de México en Defensa de la Tierra, el Agua y su Cultura (Original Inhabitants and NGOs estern State of Mexico coordination in defense of land, water and culture); Frente Amplio No Partidista en contra del Nuevo Aeropuerto y otros Megaproyectos en la Cuenca del Valle de México (Non parties wide front against the New Airport and other Megaprojects in Mexico’s Valley); Fundación Vida, Naturaleza y Legado de la Cuenca de México; Red Casa de los Pueblos-México; Asociación de Tecnología Apropiada, A.C.; Pacto de Grupos Ecologistas; PRAXIS en América Latina; Comunidad Terapéutica Madreselva; Movimiento de Abogados Insumisos Zapatistas-MAIZ; Colectivo Infrarrealismo Jurídico; EDENAT-En Defensa de la Naturaleza; Pobladores Originarios de Texcoco, Estado de México; Pobladores Originarios de Papalotla, Estado de México; Pobladores Originarios de Chiconcuac, Estado de México; Pobladores Originarios de Chimalhuacán, Estado de México; Pobladores Originarios de Ixtapaluca, Estado de México; Pobladores Originarios de Ecatepec, Estado de México; Pobladores Originarios de Chicoloapan, Estado de México; Red Coyoacán Digna Rabia; La Casa de la Chinampa de San Gregorio Atlapulco, Xochimilco, Ciudad de México; Colectivo de Telefonistas Zapatistas; Unidad Popular Independiente-UPI; FPFVI-Frente Popular Francisco Villa Independiente; Café “Zapata Vive”; UPREZ-Benito Juárez; MAS-Movimiento al Socialismo; Colectivo Zapotlán del estado de Hidalgo; Movimiento Urbano Popular-MUP-FNAMUP; Mujeres Tlalpan con el CIG; Proyecto “Angel de la Historia”; Colectivo AEQUUS-Promoción y Defensa de Derechos Humanos; Comunidad Indígena Otomí Residente en la Ciudad de México; Colectivo Zapatista Neza; Coordinación Metropolitana Anticapitalista y Antipatriarcal con el CIG (Redes, Colectivos, Organizaciones, Individu@s y Adherentes a la Sexta Declaración de la Selva Lacandona en apoyo al Concejo Indígena de Gobierno para México y su Vocera MariChuy); AnimaNaturalis Internacional; Red Tlalpan de Apoyo al CIG; Asociación Cívica Mexicanos Unidos. Profr. Alfredo Velarde Saracho de la Facultad de Economía de la UNAM; M.C. Adriana Matalonga Rodríguez Ecoactivista; M.C. Jesús Antonio Rojas Méndez Profesor de la Universidad Iberoamericana Puebla; Profra. Martha Lechuga Luna-Sección 9ª CNTE; Donatto Daniel Badillo Cuevas Poblador Originario de Santa Catarina, Acolman, Estado de México y Doctorante en Estudios Latinoamericanos UNAM.